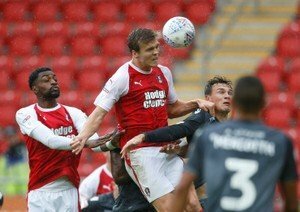 Rotherham United will be without defender Sean Raggett for some time to come. The twenty-four year old, who is on a season long loan from Norwich City, fell awkwardly last Saturday at the DW Stadium and, after treatment, limped from the pitch with, what now turns out to be ligament damage to both knees and an ankle. Such a shame for the lad and for the Millers. I have to admit I was a bit dubious the first couple of games I saw him in and thought he didn’t seem up to the job but, I was then pleased to admit, that it suddenly seem to click with him (or, to be fair, it could have been me!) and he was one of our better defenders. And it looked such a silly injury to be honest. He just went to tackle a Wigan player and get the ball out and went down in a heap. The stretcher was ready straight away but I think we were all pleased to see him walk from the pitch. All at Vital Rotherham send our best wishes to Sean and hope his recovery is a quick one.